Thank you to Daniel Shepherd for this research. Stanley Gardiner was born in Dorking on 4th November 1886 and was the son of George and Elizabeth Gardiner. 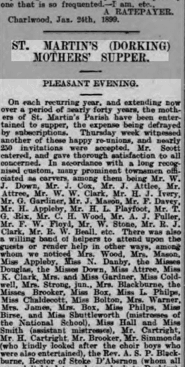 He was baptised at St Martins church in Dorking, 12 December 1886. In 1891, Stanley was living with his parents, one servant and six siblings at 16 Vincent’s Road Dorking. The names and ages of his brothers and sisters were: Beatrice M Gardiner (13), Edith M Gardiner (11), George A Gardiner (9), Florence M Gardiner (8), Constance H Gardiner (6) and Dorothy E Gardiner (2). His father was solicitor’s clerk, a position he would retain until retirement. George in his spare time would paint. The Museum holds several examples of his work. 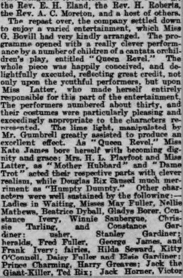 In 1899 at the ‘Mother’s Supper’ St Martins Church, Stanley and his sisters Constance and Dorothy along with many other young children, put on the play ‘Queen Revel’ for the amusement of the townspeople. His father, a prominent member of the company, helped carve at the event and his mother was a helper. The Gardiner’s were at the same address in 1901, with a new addition to the family: baby Vincent. Beatrice, Edith and George had moved on and Florence had taken up occupation as a draper’s assistant. Stanley was unemployed and aged 14. In the 1911 census, Stanley is living in Cumberland working as a manager at a local hotel. He had lied about his age, added an extra 5 years to his 25. Sometime between November 2nd and December 14th 1914, Stanley signed up to the army and was enlisted in the 2/4th Battalion, London Regiment (Royal Fusiliers). After an extensive training regime, poorly equipped though they were, his battalion moved out to Malta on December 31st. It was a period of relative calm involving garrison duty for the most part and vigorous arms training. August 25th saw the battalion moved to Egypt and then eventually onto Gallipoli on October 1915 at Cape Helles. During August and September, increasing pressures were mounted on the forces by the withdrawal of the Russian allies and the interruption of supply lines by enemy submarine activity: hence the need for more troops in the area. The newly arrived 2/4th battalion took over the trenches of the first brigade and set straight to work. Soldiers in the 2/4th, even “when at rest” could not escape the shelling; so slim was their purchase on the headland. On October 20th, the 2/4th relieved the 2/2nd London Regiment in the ‘Eski line’, a trench some 1500 yards behind the foremost trench. The movement of troops was a success, however the battalion suffered its first casualties. On the 27th, the 2/4th were relieved and sent to the rest camp. On October 30th and November 1st, the London regiment were bombarded by artillery whilst at the rest camp. At the time they were building new winter quarters. As autumn progressed, the weather began to get worse as rain clouds undid hard work and killed men. The British occupied only as small part of the peninsula and so any clothes which got wet remained wet, having no place to dry them, and illness was rife. 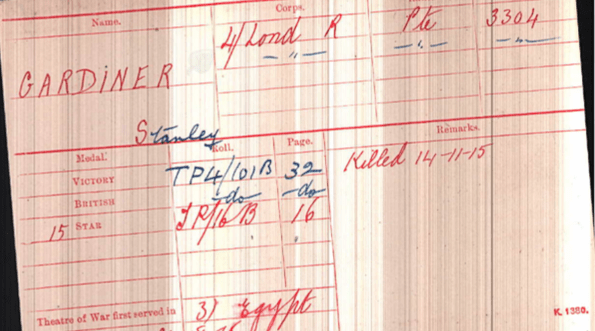 On the 14th November 1915, Stanley Gardiner was killed 10 days after his birthday. It is likely he was killed in the same accident which took the life of his comrade Hubert Walter Waller, however enemy action could have also been the culprit. Stanley Gardiner was chosen at random to represent all the fallen of Dorking and the surrounding villages. 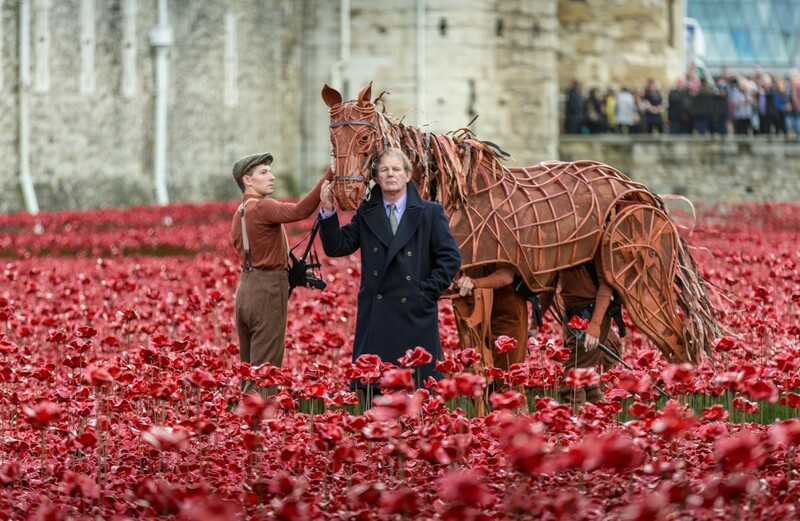 His name was read out at 6.25pm on the 19th October 1914 at the Tower of London poppy-filled Tower moat by Michael Morpurgo. View the full Roll of Honour here.